Photo courtesy of Michael Jacoby/Count Basie Theatre. 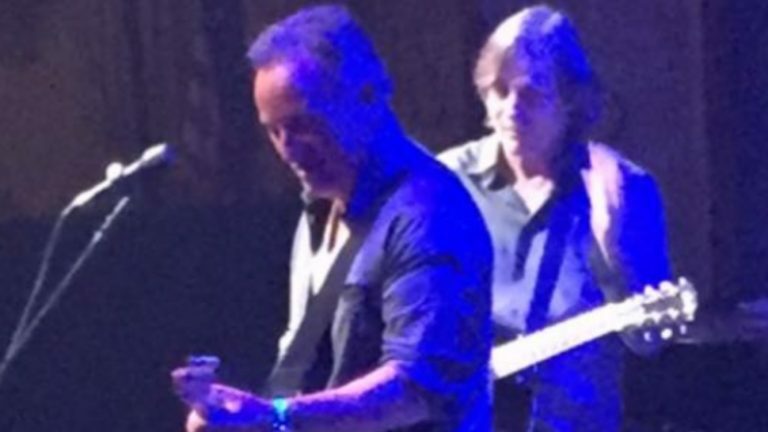 Jersey Shore native Bruce Springsteen joined Jackson Browne on stage last night at the Count Basie Theatre in Red Bank. Springsteen accompanied Browne for the encore, performing “Take It Easy” and ending with “Our Lady of the Well,” according to Michael Jacoby, the theatre’s technical director. Browne and Glenn Frey wrote “Take It Easy,” a rock staple and the Eagles first single in 1972. In July, Springsteen made a guest appearance at the Wonder Bar in Asbury Park, joining Joe Grushecky and the Houserockers for 15 songs. The Freehold Boro-born rocker, who turns 66 today, has appeared as a special guest at the Count Basie Theatre “many, many times,” according to Jacoby.